Home > Shurhold Medium Fuel Filter Funnel 5 gal./min. 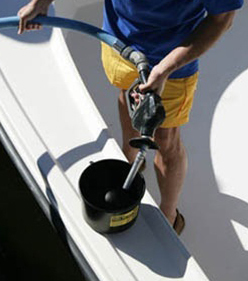 Are you using watered-down fuel in your boat? The Shurhold Medium Fuel Filter Funnel removes dirt, debris, and WATER from fuel. The filter funnel ensures that you're putting fuel and only fuel into your boat's fuel tank. The Shurhold Medium Fuel Filter Funnel is perfect for small to mid-sized boats. If you have a gas can in the garage, you don't know if sediment has settled into the fuel. When you fuel up your boat at the dock, you don't know if the fuel is pure. The only way to guarantee that you're putting clean fuel into your gas tank is to use the Shurhold Medium Fuel Filter Funnel. The Shurhold Medium Fuel Filter Funnel filters to 5 microns to hold back water and sediment from entering the fuel tank. Five microns is smaller than a water molecule but big enough to allow gas molecules through the filter. Watch the video below for a demonstration of how well the filter holds back water. Just pour the fuel through the Shurhold Medium Fuel Filter Funnel into your fuel tank. Water, dirt, and sediment will be caught in the filter! The Shurhold Medium Fuel Filter Funnel filters 5 gallons per minute. It's the perfect size for small and mid-sized boats, which may or may not have fuel filters at all. If they do, they are not sufficient to filter out water. Only the Shurhold Medium Fuel Filter Funnel stops water and debris from entering your boat's fuel tank. Don't get stuck on the water with a stalled engine. Use the Shurhold Medium Fuel Filter Funnel to filter out water, dirt, and debris to protect your boat's engine.